I have been doing a bit of research on city buildings and I remembered that I have a note somewhere (from info you sent me) that Peter Ready had a shop at 165 Sussex Street. I went down this morning not expecting much and unsurprisingly 165 is no longer there. 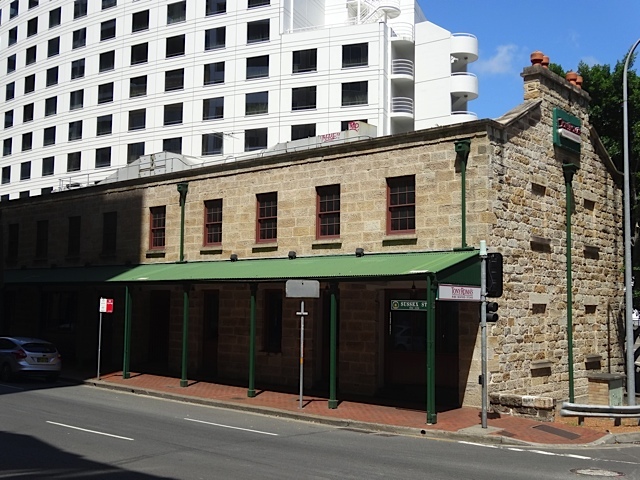 However the block it was in is largely still 19th C because the Sheraton 4 Points Hotel occupies the whole site and apart from what I calculate to be about 161-169 (which have been demolished for the main entrance ) the rest of the Western side of the street is intact and incorporated into thehotel. 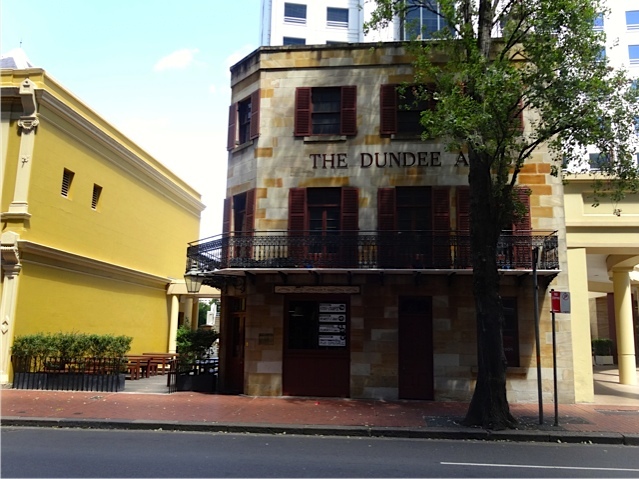 This pre 1860s pub is at 171 and is directly to the left of the Entrance Drive way. The yellow building to the left of it is the Corn Exchange (originally a fruit market and the oldest existing market building in the city) from 1887. 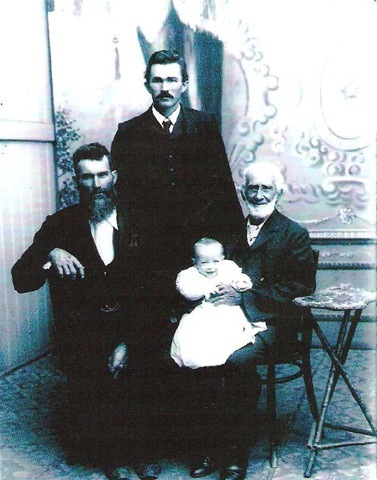 My grandmother, JESSIE SARAH READY ( BELL) and her family were resident in LITTLE YOUNG STREET REDFERN. i shall confirm the dates later but we were told the house was under where the Greek Orthodox Church now stands. The time in Redfern was late 1800s to early 1900s. I have found a few snippets as background for the times. http://nla.gov.au/nla.news-article13716158 Sewage comes to Redfern. http://nla.gov.au/nla.news-article14621972 Lily and Sidney Sullivan , aged 7 and 9 years swallowed some liniment by mistake. 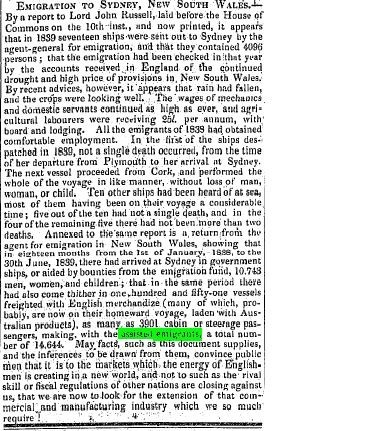 The Sydney Morning Herald (NSW : 1842-1954) Wednesday 16 January 1889. More poisonous liniment. THOMAS SANDERS WHO CAME AS CONVICT ON THE MATILDA IN THE 3RD FLEET IN 1791 IS SAID TO BE CONNECTED TO OUR SANDERS’ WHO CAME AS ASSISTED EMIGRANTS ON THE VICTORIA IN 1849. HERE ARE SOME RANDOM THOMAS SANDERS ENTRIES IN NLA NEWSPAPERS. MIGHT BE OUR THOMAS. MIGHT NOT. Johannah was my great-great-great-great grandmother on my mother’s side as they say. That is – she was my GGGGGrandmother if in fact it was her son who fathered Peter Mark. It could have been one THOMAS HOGAN. For the time being we will stay with the legal records and claim Johannah as kinfolk. This is her story as Phil Ready recorded it for READY OR NOT. Among the prisoners was 47 years old Johannah Ready sentenced by the court during 1811 in County Tipperary, Ireland to fourteen years transportation to the Colony. On disembarking at Sydney Cove, Johannah was taken to the women’s barracks and then allocated to work at Government House Windsor. This necessitated a journey that was long and dangerous at that time for there were many thieves and bushrangers about so the party travelled with an armed guard. Johannah is listed in the Windsor Ration Book as receiving rations during 1813 and 1815 ( loc A 803 pp 59,90,122 ML) and during this time became Housekeeper at Government House. Records show that she received payments for this position during 1814 and 1815 from the Police Fund. (Wentworth Papers loc. D1 M4 pp 121 137 ML) Her salary was published in the following editions of the SYDNEY GAZETTE. 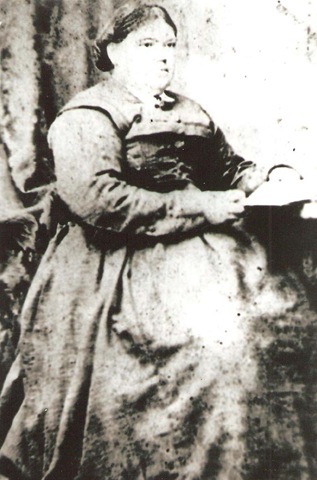 As housekeeper at Government House Johannah would have come in contact with some of the most influential people in the Colony including the Rev Samuel Marsden and William Cox , Magistrate. Johannah’s son John Ready, arrived as a prisoner aboard the convict ship THE THREE BEES in June of 1814 and by the end of the year had become overseer of the Government Dairy at Windsor. In July of 1814 there was great excitement in the Colony for Governor Macquarie had accepted the generous offer of William Cox to build a road over the mountains along with the route discovered by Blaxland, Lawson and Wentworth. So well did the team work that by 21 Jan 1815 the road had been completed and by May the Governor with his wife and a well equipped party was able to travel along the new road from Parramatta. Crossing the mountains Macquarie was able , with the help of Cox to lay out the proposed town of Bathurst on the banks of the Macquarie River which had been discovered by George Evans the previous year. Two years later John and Johannah both still at Windsor, testified at an inquest held on Wednesday 16th December 1817 into the accidental drowning of a dairy stockman. 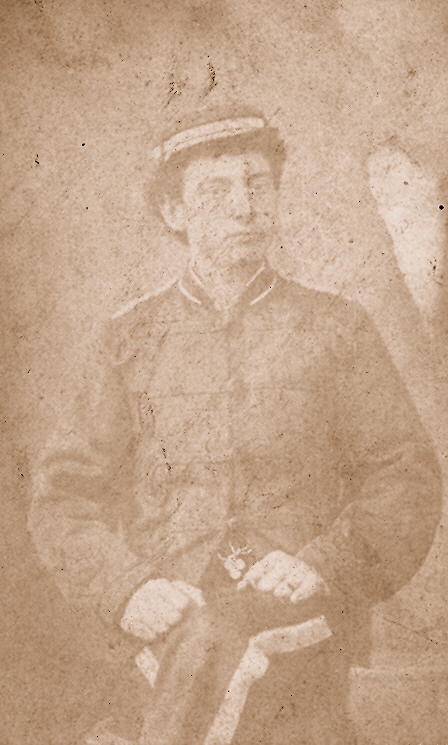 In their testimony they stated that the stockmen John Holland and Edward Knight were good friends at the time of the accident. Holland and Knight had gone to a nearby creek to bathe at a spot that John Holland considered safe but unfortunately neither could swim and when Holland got out of his depth Knight was unable to help him. He ran to a nearby Mill but being unsuccessful there went on to Government House where he asked the Gardener for help. As only one of those who came to help could swim ( very few people at that time could) it was two hours before John Holland’s body was recovered. On 31 August 1819 both Johannah and John Ready received their pardons from the Governor and just over 6 months later on 7 Feb 1820 John married Elizabeth Curtis, daughter of John Curtis and Ann Moran . Elizabeth born in 1803 was now 17 years of age and John 30. Although of the Catholic faith the wedding took place in St Johns Church of England Parramatta for at that time Catholicism was discouraged with no Catholic Priest being allowed to officiate. as making a subscription towards this aim. However as the Chapel had not been built by the 9th June 1824 Johannah was obliged to use St John’s Church, this time for her own wedding , for at the age of 59 she married 46 year old FRANCIS PRENDERGAST. Two descendants have now made contact – Marilyn and Penny. See their comments on previous entries. Hannah then is landed in Sydney. Two years later on 15 march 1826 she is listed with these names HANNAH (HITCHINGS, HITCHINS, HITCHERS OR HUTCHINS ) as a spinster of Parramatta when she has the permission of Governor Darling to marry THOMAS BENSON, Batchelor at St Johns Church, Parramatta. The ceremony was carried out by the assistant chaplain , Thomas Hassell and was witnessed by John Baker and Christabella Ferguson. The same year Hannah gave birth to another daughter whom she named Hannah, this time the father was Henry Samuels whose surname the child bore.